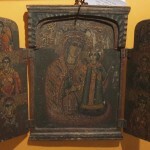 Many religious homes in Russia have icons hanging on the wall in the “krasney ugol” or “beautiful corner”. 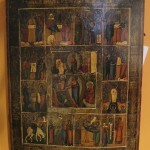 The icons are meant to educate the viewer in the teachings of the bible and are typically painted on either wood or copper. 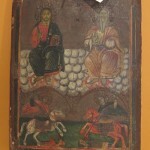 We think they are quite beautiful, as well as educational, and currently carry four examples of lovely 18th and 19th Century Greek and Russian Icons in the shop. They are perfect Christmas presents for those who wish to remember and honor the upcoming Christian holiday within a gift itself. Fun facts: The reason that creating an icon is referred to as “writing” an icon is that they can be compared to a carefully constructed poem. Every “word” or element fits very concisely and precisely to contribute to the overall meaning and integrity of the piece. 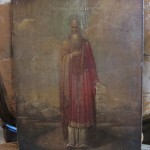 The iconagrapher often prayed and fasted before “writing” his religious art. You will find that icons are typically not signed then, since it is said that a true icon is inspired from above. Our four examples here illuminate just how different each icon can be in terms of painting style and subject matter. We suggest hanging them on a small but well-lit wall in a prominent spot so that they get all the attention they deserve. They will certainly help you create your own “beautiful corner” in your home!